Finance Minister Mr. Arun Jaitley presented the budget on February 1. 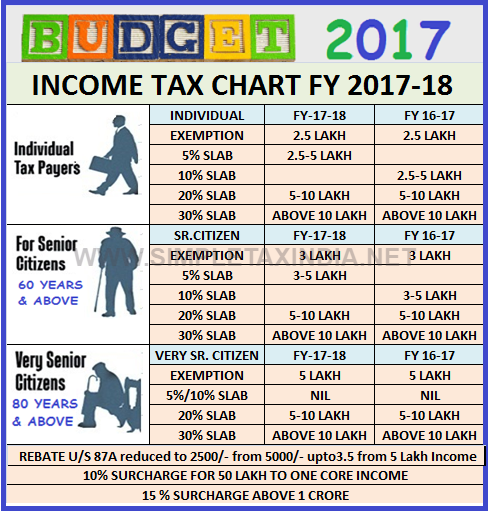 In this budget there are some changes in the income tax slabs and structure which changes all income tax calculations for financial year 2017-18. These changes are as under. Income tax rate is on slab 250000-500000 is 5% for FY 2017-18 which was 10% earlier. Rebate u/s 87A which was earlier given upto Rs. 500000 slab is reduced to Rs. 350000. 10 percent surcharge on 50 lakh to 1 crore income. 15% surcharge on above 1 crore income. So there is an excel based calculator for calculation of income tax for individual, senior citizen as well as super senior citizen. Appreciable effort for income tax payers.